During the course of a week scores if not hundreds of people, mostly local residents, walk from the village of Lyng to the bridge over the Wensum. Many go way beyond. Up Sparham Hill for a mile to catch a bus. A few hundred metres to walk round Sparham Pool. Some to fish, some to just enjoy, some are twitchers, some are dog walkers. Large groups may be ramblers, drawn by the wonderful River Wensum and the new Wensum Way trail. They all have one thing in common - a high risk of being hit by a car. For there is no foopath along this section. 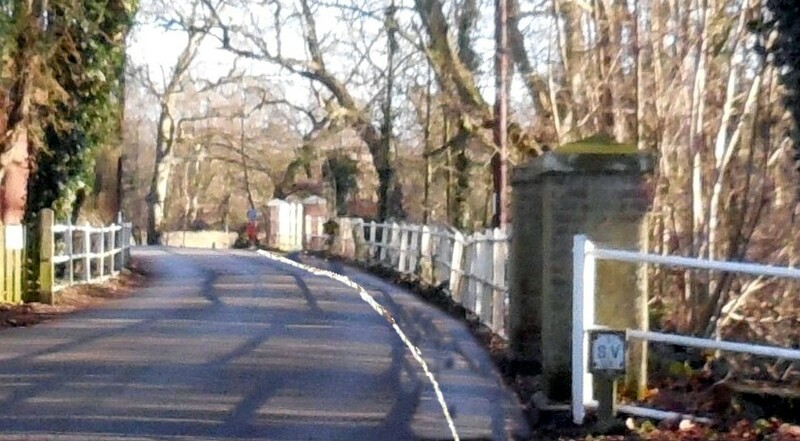 The Causeway to the bridge is nominally wide enough for two cars but not two cars and a pedestrian. And certainly not anything bigger than a car. Since this is a farrming area the number of Very Large and Heavy Goods vehicles is unusually high. There is a 30 mph speed limit but it is too often ignored and worse. Some cars will approach from the west at nearer 50; some even from the village have already reached 40plus. They make no concession to pedestrians, despite the Highway Code which makes it unlawful NOT to give pedestrians right of way in such circumstances. The words are "reasonable consideration" but they are ignored. I am not alone in having been touched by a car forcing its way past me, my dog and a vehicle coming the opposite way. No harm done except to my confidence. Back before the road bridge replaced the ford - around the 30s it seems - there was a footbridge here. And close by is the old weir bridge that served the long-gone Lyng Paper Mill. But nthat was when traffic was light, smaller and slower. Now there is no facility of any sort for pedestrians. Despite that, this forms part of the Norfolk County Wensum Way ramblers trail. Norfolk County has said will do something but has no money. 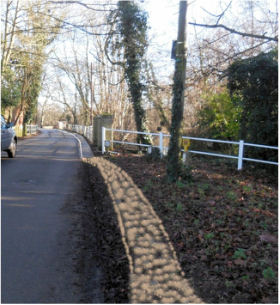 The "something" is not much although it includes the levelling of a footpath as shown below and which would be welcomed. It does not include the more critical provision of a pedestrian refuge marked out along the Causeway itself and the essential warning signs for motorists at eitrher end. 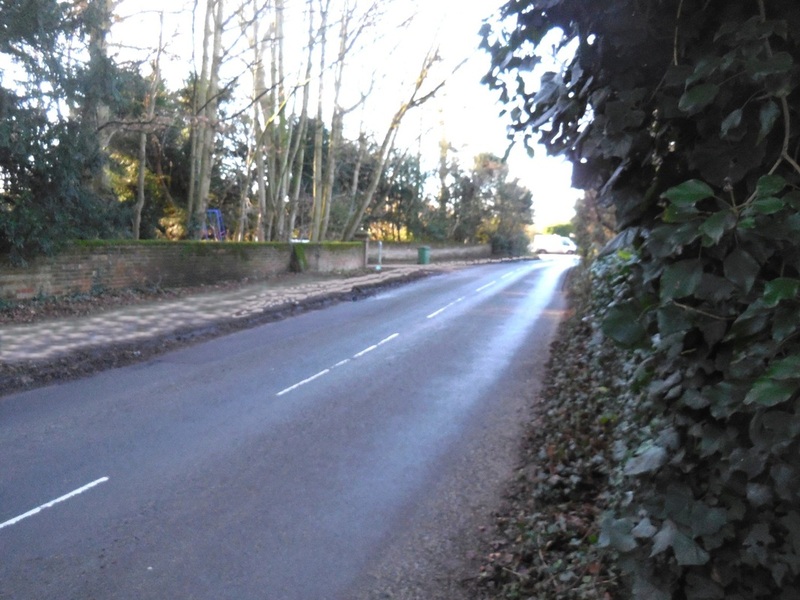 I personally would like to see a chicane and 20 mph limit here but there is little room for traffic to queue (as if there was that much generally) and make the chicane effective. This shows how the road might look with a refuge marked out. There is detritus alongside the parapet which impedes pedestrians - clear it and mark up a walk way. Why not? Signs at each end of the causeway could proclaim "Beware - Pedestrians on bridge". It would not much change the 'highway' width. 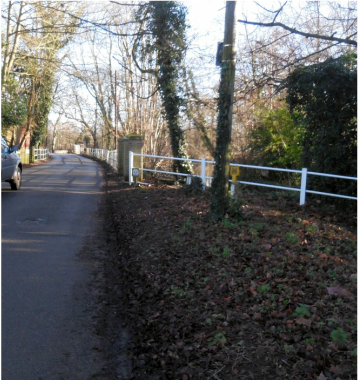 This extends that footpath back towards the village, at last providing a safe passage through the very dangerous s-bend between Port Row and Rectory Road. This shows hope the verge could be levelled and a footpath provided on the section before the Causeway.